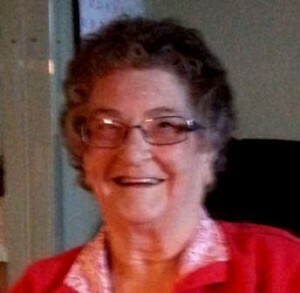 Thelma “Peg” (Baer) Francisco, 87, of Madera died Sunday, Dec. 22, 2013 at Windy Hill Village, Philipsburg. Born Sept. 17, 1926 in Juniata, she was the daughter of Irvin and Myrtle (McGarvey) Baer. She wed Steve M. Francisco Sr. on April 9, 1948 in Hagerstown, MD. She was a 1946 graduate of the Madera High School. She was a homemaker. Also, she was a member of Brisbin Baptist Church. She’s survived by three sons and three daughters, Steve (Nancy) Francisco, David (Geraldine) Francisco and Pamela (David) Mills, all of Madera; John (Carol) Francisco of Tubbs Crossing; Joyce (Russell) Link of Dysart; and Patti (Ronald) Sunderlin of Forest. She is also survived by 13 grandchildren, David (Emily) Francisco, Heather (Eric) Sacharczyk, Scott Francisco, Charlotte (Brian) McMullen, Shannon Link, Justine (Justin) Pruskowski, Andrew (Molly) Mills, Nathan Mills, Stephine Francisco, Hannah Sunderlin, Beth Sunderlin, Luke Francisco, Thad (Nicole) Francisco and 22 great-grandchildren. She is also survived by one sister, Janet Carns of Madera and numerous nieces and nephews. She is preceded in death by her husband, Steve, whom died Dec. 25, 2000; three sisters and one brother, Mabel Dillen, William Baer, Phyllis Heverly and Gladys Ingram. Friends will be received from 6 p.m. – 8 p.m. Thursday and from 9 a.m. – 10:15 a.m. Friday at the Kruise Funeral Homes Inc., Madera. A funeral services will be held at 11 a.m. Friday at the Brisbin Baptist Church, Brisbin, with Pastor Mark Melhorn officiating. Burial services will follow at Bell Cemetery, Glen Hope. Memorial contributions may be made to the Brisbin Baptist Church, P.O. Box 7, Brisbin, PA 16620. Obituary Notice: Paul A. Kolesar Sr.